The Sun Mar Centrex 3000 NE is rated for 5 adults or a family of 7 on a constant basis or 8 adults or a family of 10 on a weekend or holiday basis. The Sun Mar Centrex 3000 NE (Non-Electric) composting toilet system employs continuous flow design for medium residential use. 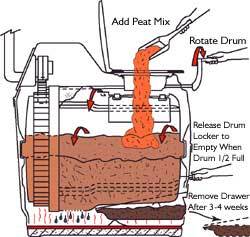 With a continuous flow system, rotation of the drum moves compost along the drum before it drops automatically into the collection housing (50 litre) at the end of the unit. 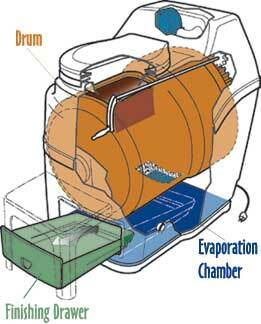 Under normal operating conditions the drum will not have to be turned backwards for emptying. This auto fill feature is unique to the Centrex 3000 series. Download Sun Mar Centrex 3000 NE drawing. 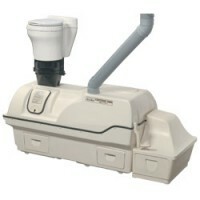 The Sun Mar Centrex 3000 NE composting toilet system features a 4″ vent stack which is used to vent the unit passively. We also include a 12 volt 2.4 watt fan that is required in the vent stack to assist airflow. The Sun Mar Centrex 3000 NE composting toilet system is designed for use with a Sun-Mar 18″ Elongated Dry Toilet (included in the price). A pipe piece, 45″/ 1143 mm in length and 10″ / 254 mm in diameter, is supplied with the unit. The only restriction on installation is that the Dry Toilet needs to be directly above the unit so that there is a straight drop. 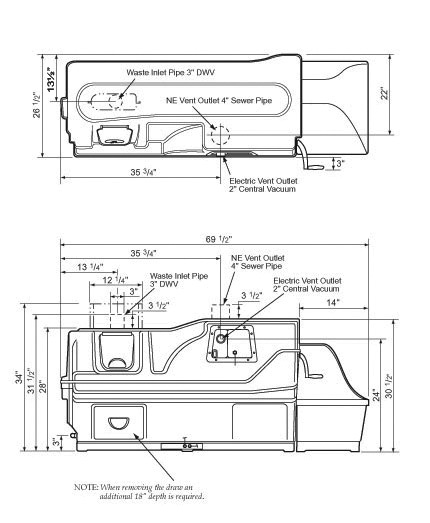 The pipe piece can be cut to size and additional pieces ordered if necessary.There is also a transition piece that is 8″ / 205 mm which connects the composter to the down pipe so the minimum distance from the base of the composter to the base of the toilet is the height of the composter + the transition piece ( 864 + 205 = 1069 mm). Although an additional 6″ /150 mm working room is recommended. Sun Mar Centrex 3000 NE composting toilet systems are supplied with a 1″ drain hose which must be connected to the 1″ drain at the bottom left of the unit. Using the centrex you either use the dry toilet, which must be directly above the centrex, OR the one pint flush unit. You cannot have both. The one pint flush units cannot be further than 4.5m (15′) horizontally from the centrex unit.